In the wild a bird’s feeding times would be at dawn and dusk. If it’s possible to work into the lifestyle of your family, keep your bird’s feeding schedule as close to this as you can. 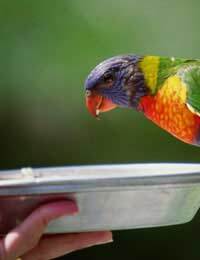 Encouraging kids to feed their birds directly before or after breakfast and dinner is a good way to maintain the natural feeding patterns of your bird. Formulated foods like pellets and crumbles are a nutritionally balanced way to fulfil the bulk of your bird’s daily dietary needs and are convenient for those with busy lifestyles as pellets can be left in the cage all day long, unlike fresh foods. It’s important to choose a high quality brand of pellets that is breed specific to meet all the nutritional requirements your bird has. Try and avoid brands with additives, artificial colours, preservatives and flavours. The downside of pellets is it can be a little difficult to switch a bird over to formulated foods, especially those who are seed addicts or fussy eaters. A good method for switching is to combine the seeds and pellets together, gradually reducing the amounts of seeds, or grinding down the pellets at first and sprinkling them over a favoured food to get your bird used to the taste. Different brands will attract birds in different ways, so ask for samples and see what catches your pet’s fancy. Seeds are fattening but far from unhealthy for your bird. In a natural habitat, seeds are a tasty and essential part of the bird diet as the high calorie content gives them great energy reserves to use. But in a tame environment, all but the most active of birds do not get a chance to burn off the calories and fat that seeds contain so a seed diet can eventually lead to bird obesity and illness. Birds can also become quite addicted to seeds and turn their beaks up at other foods. However, fat in your bird’s diet is necessary for absorption of vitamins A, C, D and K so don’t cut it completely out of the picture. Keeping seeds at about 20 percent of the daily diet and for treats and rewards is a formula that works well with many breeds of bird. Sprouts are considered an avian superfood, are a live food and have exceptional nutritional qualities. You can test your bird’s seed mixture for freshness by putting them in soil to sprout, then feeding them to your pet for the added benefits that aren’t in mature seeds. In nature, birds would pick out young, fresh green seeds to eat instead of mature, so feeding sprouts replenishes the nutrients that are lost. You can also feed your birds organic sprouts from the store. Veggies are a healthy part of a wild bird’s diet, but many birds that have been raised on pellets and seeds don’t know what to think about vegetables at first and may refuse to eat them. A fun way to increase your bird’s interest in eating vegetables is to have dinner with your pet, taking bites of vegetables and showing the bird what you are eating, then giving the rest of the piece to your bird to eat. Kids especially enjoy this game, and your bird will soon be willingly consuming all sorts of vegetables. Use colourful veggies to make them more attractive to your pet, reds, oranges and yellow vegetables work especially well. Don’t neglect the dark green veggies, though, as these are rich in nutritional value. Fresh produce should always be carefully washed before being given to birds, as they are extremely sensitive to chemicals and pesticides. The amount of fruit a bird needs in its daily dietary requirement is very breed specific, so you’ll need to take your bird’s natural diet and habitat into consideration. While some birds consume large portions of fruit in the wild, for most species fruit makes up only a small portion of a bird’s diet and can result in loose, messy stools if overfed. Fresh foods have nutritional qualities that are lacking in seed and pellet mixtures, so make sure your bird gets a dose of wholesome veggies and fruits as well.